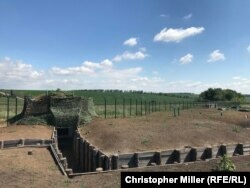 Dubbed in i ts early days "Project Wall" and known also as "The European Rampart," the barrier was intended to fortify a significant section of Ukraine's porous eastern frontier while both literally and symbolically separating the country from its Soviet-era hegemon. As it stands, the wall project covers merely a fraction of Ukraine's 2,300-kilometer eastern border with Russia. It comprises 170 kilometers of trenches; 72 kilometers of fencing; a 165-kilometer patrol road; a 19-kilometer ground strip fitted with seismic sensors to detect objects of more than 60 kilograms; and four frontier posts with 17-meter-high watchtowers equipped with securit y and thermal-imaging cameras. "It would be naive to expect that this type of structure...would make any difference," Oleksiy Melnyk, a Ukrainian political and security analyst at the Kyiv-based Ruzumkov Center, a nongovernmental public-policy think tank, says of a possible Russian attack. "This so-called wall is not suitable, in military terms." Kharkiv, an industrial city 480 kilometers from Kyiv, is the country's second-largest city with 1.4 million residents and a Ukrainian military stronghold. It withstood an initial attempt by pro-Russia separatists to seize control in 2014. Swaths of the Luhansk and Donetsk regions with more than 4 million inhabitants and a 400-kilometer border with Russia remains under the control of Moscow-backed separatists. Kyiv and international observers accuse Russia of exploiting Ukraine's loss of control there, slipping its forces and equipment easily across the border to back separatist offensives and even launch its own when those fighters need extra help against government troops. She concedes that the wall would not defeat a Russian offensive. But that's not its point. "It gives us time to organize the first line of defense while we w ait for the [Ukrainian] Armed Forces to arrive," she says. "We understand very well that it can't stop tanks." 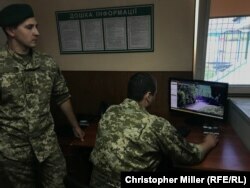 It's this aspect of the project that has drawn ridicule from many Ukrainians. A well-known journalist and commentator called the wall a "pathetic fence," and a member of parliament described it as a "4 billion-hryvnya pit." It has also angered residents of border towns and villages who complain it's an eyesore and a barrier that has disrupted their lives. Some complain it keeps family and friends apart. Local farmers bemoan the loss of fields that stretched into Russian territory where their livestock used to graze. A major reason locals were able to move so freely across the border and constructing the project has been such a headache is that the countries' shared border was never properl y demarcated after the collapse of the Soviet Union. "They must understand that that there's an aggressor on the other side," Ivanets says of such complaints, adding that she hopes critics will come around at some point. "We must keep Russia out." 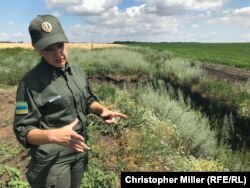 That FBI-trained anticorruption agency -- formed in the wake of the Euromaidan protests as Kyiv set out to implement crucial reforms to secure Western aid -- found that some of the patrol roads along the wall where border guards cruise in fourwheelers, for instance, were narrower than the planned three meters and that at least $365,000 was stolen from its budget. Eight people from the Border Guard Service of Ukraine and local contractors were detained in August and November 2017 for alleged embezzlement. On J uly 5, NABU announced it had completed its pretrial investigation into their actions and prepared an indictment for special anticorruption prosecutors to send to court. "Moscow openly does not want to have a border between Ukraine and Russia," he says. "Therefore, the Kremlin is ma king tremendous efforts to disrupt or discredit any border project." According to Ivanets, Ukrainian border guards see men in military uniforms on the Russian side of the frontier "practically every day." Recently, the rhetoric from Moscow and Kyiv has become more aggressive, with Russian President Vladimir Putin predicting just days after his Helsinki summit with U.S. President Donald Trump a "serious risk of escalation" in eastern Ukraine. "We understand that this is a matter of national security," he says, "so we need to complete it under any co nditions."